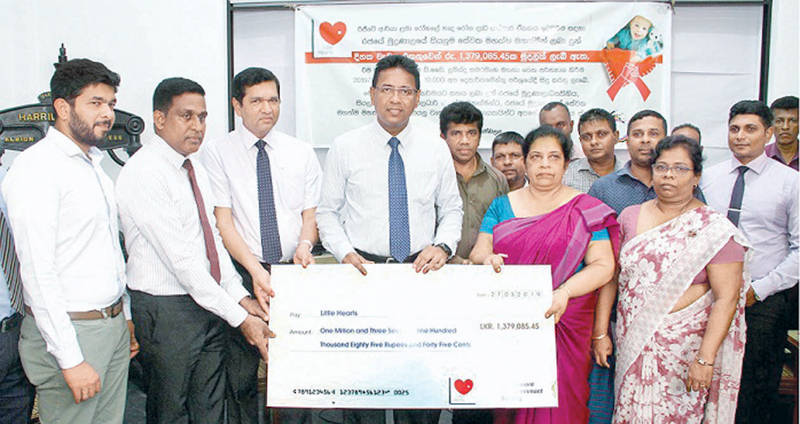 The funds were handed over to Dr. Duminda Samarasinghe, Consultant Paediatric Cardiologist at the Lady Ridgeway Hospital by the Government Press staff unions. The Printing Department (Government Press) made a sizeable donation to the Little Hearts project at the Lady Ridgeway Hospital last Wednesday (27). An initiative of the trade unions, this donation is an example of people joining hands to support a cause they believe in. To change the fate of thousands of the Nation’s children, these workers decided to donate a days-worth of their salary to Little Hearts. This sacrifice led to a total of Rs. 1,379,082.45 being donated and this donation enabled the possibility for 137 children’s hearts beat a while longer. Helping to save the life of one child does not save the world but it will change the world for that one child. This becomes synonymous to thousands of lives when it comes to the ‘Little Hearts’ project: an initiative, in collaboration with the Sri Lanka College of Paediatricians, to build a 12-storey Cardiac and critical care complex at the Lady Ridgeway Hospital for children. The funds were handed over in good faith to Dr. Duminda Samarasinghe, Consultant Paediatric Cardiologist at the Lady Ridgeway Hospital. All of these funds will be used in the process of building a Cardiac and Critical Care Complex to treat children with heart disease and critical illness. An estimated 10,000 children are to be saved at this facility every year. The Little Hearts project’s main objective is to provide timely, appropriate and the best possible care to all children with heart diseases and critical illnesses. Instigated to provide a solution for lack of Cardiac facilities at LRH, this project is vital in decreasing the infant mortality rate in the country, leading to an overall improvement in the standard of healthcare. Statistically, more than 3000 babies are born with heart disease each year and comprises of 24% of all babies born with birth defects per year, making it the number #1 most common birth defect. As LRH is the premier public children’s hospital in the country with a bed strength of 900+, the current facilities at the Cardiology unit, Medical Intensive Care Unit and the Neonatal Intensive Care Unit needs to be improved if we are to provide timely and appropriate treatment to all children who come to LRH seeking treatment. Approved by National Planning Department and the Health Ministry, the cost of the Little Hearts project is Rs. 2 billion, which is being raised with the help of public contribution.Rs.527 million has already been reached through public contributions and construction of pile foundation of the building is completed. The Civil Engineering division of the Navy, which is handed over the mammoth task of construction, has promised to complete the project within two years. There is no telling when the cause of the Little Hearts project may involve yourself or a loved one. No contribution is too small and can vary to your liking. The life of one little heart can be saved with Rs. 10,000.00 or thousands upon thousands of little lives in the future can be saved by contributing to build an entire floor which houses Intensive Care Units, Wards or even Operating Theatres; all of which are crucial when it comes to saving lives. All donations should be directed to the Bank of Ceylon: account no - 79738633 ; account name - Little Hearts. More information from the Little Hearts hotline at 0716441122 or the Little Hearts website at www.littlehearts.lk.